The main purpose of a company is creating value to the customers in an efficient and effective way. During the Service Strategy stage of the ITIL Lifecycle for services, creating value for customers are one of the key concerns. There are two factors or inputs that determine whether an IT service is creating value to its customers: Service Utility and Service Warranty. Both of these must be in place for creating value for your customer. 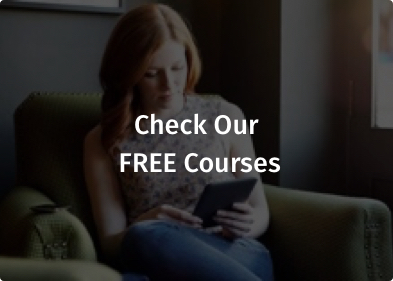 Online ITIL training will provide you with comprehensive knowledge of creating value through Service Utility and Service Warranty within IT service provision and you can test your knowledge with a sample ITIL certification exam. 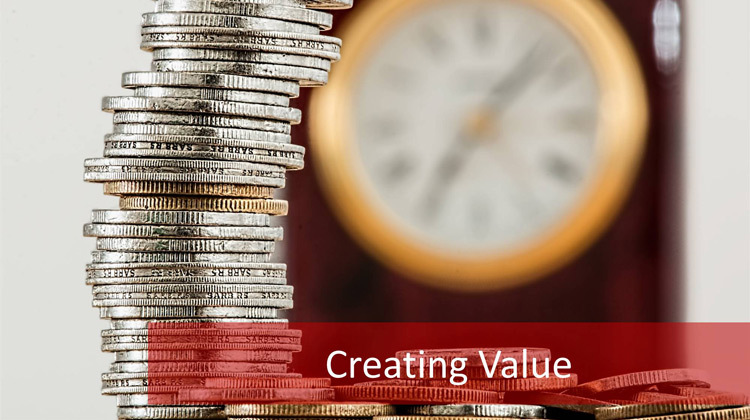 What is creating value and how do you achieve your creating value objective? In this article, we are going to review how creating value works for ITIL Service Strategy phase. 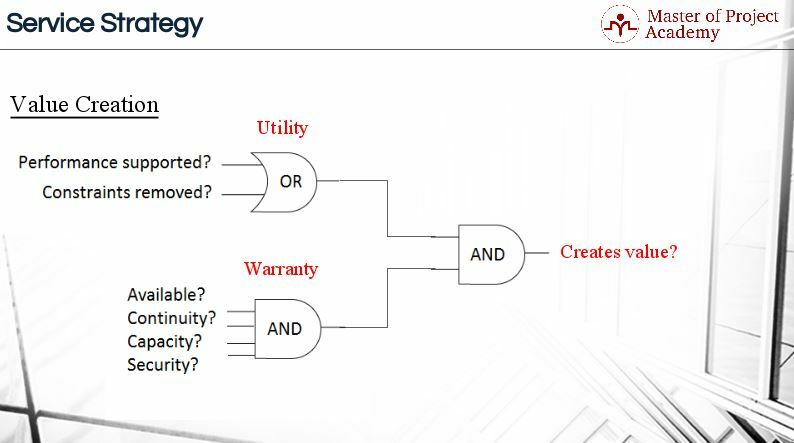 What is Service Utility and Service Warranty in the context of Creating Value? ITIL Training teaches us that Service Utility describes what the service does and Service Warranty describes how well it does it. And creating value in services is ensured by the combination of Service Utility and Service Warranty together. Service Utility is the functionality of an IT Service from the customer’s perspective. In other words, the utility is the fitness for purpose. For instance, money withdrawal is a service, and utility of this service is providing money to the customers of the bank through its ATM channels. In order to ensure fitness for purpose or the utility of a service, either the performance requirements must be supported or constraints must be removed. This way the objective of creating value to customers will be met. The warranty of a service is the assurance of the service that the agreed requirements will be met. In order to ensure the warranty of a service, availability, continuity, capacity and security requirements must be met. In case of failing to meet one of these requirements, the warranty of the service will not be ensured either. And creating value for the service can not be achieved. Service warranty is the assurance that an IT service will meet agreed requirements. These agreed requirements might be a formal agreement such as Service Level Agreement, contract or may be a marketing message or brand image. If we consider the money withdrawal service again, availability of ATMs, continuity, capacity and security of money withdrawal constitute the warranty of this service. Will you be happy if a transaction takes more than 5 minutes although it finishes successfully? Most probably no. So, warranty of a service is critical in creating value for the customers as well. This diagram shows the process of creating value for the customer. Before passing on directly to the diagram, it is best to explain the components of the diagram. If you have a background in electronics or computer science, you should be aware of AND Gates and OR Gates. In this diagram, the value is the results for this gates while utility and warranty are the inputs. For creating value as an output of the delivery of a service, the utility and the warranty of a service must meet the requirements. Failure in either warranty or utility will impact your objective of creating value directly. Only one of the inputs for utility needs to be true to be able to say that the services have sufficient utility for creating value. For warranty to be true, all the inputs must be in place. The main purpose of a service provider is creating value to its customers with its services. The customer perceives the value of a service not only in financial dimensions. Let’s imagine that you need a car. 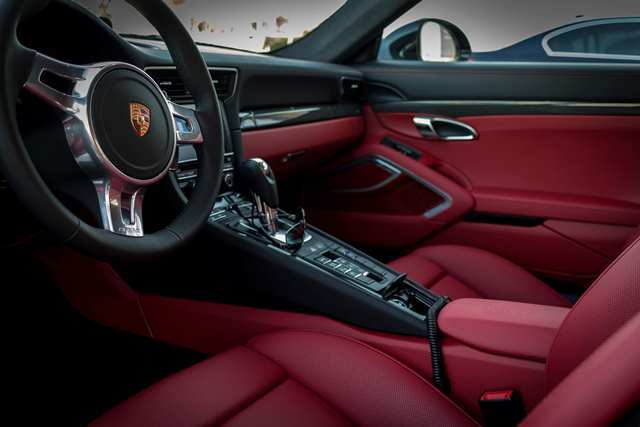 There are several brands, several features, and options in the market. Ferrari is a car, Mercedes is a car, and Opel is a car as well. They are all cars but depending on your needs and budget, you would select the optimum option. And if you buy a Ferrari, you wouldn’t think “Opel is a Car, and Ferrari is a Car as well but I paid a lot!”. This case is similar for a customer of a service provider as well. There are several telecom operators or banks and they all offer various services and require a different amount of money for the services they provide. But they all acquire customer value depending on the requirements of different customers. Customers do not only consider the amount or price they will pay for services. Value perception is shaped with the quality of the services and price of the service together. Yet, the customer’s perception of the service is secondary to the results for the customer’s business. A service is used by a customer first for meeting the business requirements. If a service is not meeting the fundamental business requirements of a customer, then there will not be a phase to initiate value perception in customer’s mind. The service could not even satisfy the basic requirements of the customer. For creating value, you should take into consideration that the value perception of the customer is influenced by three factors. The attributes of a service are the availability, performance, capacity, speed etc. Let’s consider the money withdrawal service of a bank. The service itself can be fantastic for a customer. But can you think that this service cannot be provided to more than one hundred customers concurrently, or can you think that a simple transaction takes more than five minutes? Although the service itself can be good, speed and capacity attributes of this service will severely impact the value perception of the customer. The second factor affecting the value perception of the customer is their experience with these attributes. If a service is faster compared to a competitor, the customer should experience that there is better value in this speed. The third and last factor affecting the value perception of the customer is the equipment of competitors and partners. The equipment, tools, and applications of a service provider affect its service delivery quality to its customers. Although the service is similar, using better equipment, tools, and applications to deliver services to customers will increase customer attraction and help to acquire new customers for the organization. If your service can provide real and perceived value to the customer through effective utility and warranty, you achieve your creating value objective and also you are likely to keep existing customers coming back and drawing new customers to your business. ITIL Service Strategy: What does the customer want? Strategic Capabilities and Resources in an IT business: Harness it now!